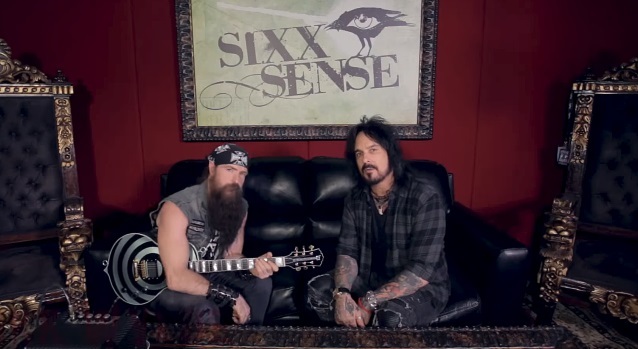 OZZY OSBOURNE guitarist and BLACK LABEL SOCIETY frontman Zakk Wylde is featured in the latest episode of MÖTLEY CRÜE bassist Nikki Sixx's new original video series, "My Favorite Riff With Nikki Sixx". In the episode, which can be viewed below, Zakk plays his signature bulls-eye design as he and Nikki talk about making musical soup and playing for the boss, Ozzy Osbourne. Zakk's advice when it comes to music: don't worry about what other people are doing, do what you like. BLACK LABEL SOCIETY's tenth full-length album, "Grimmest Hits", will be released January 19, 2018 via Entertainment One (eOne). Wylde reunited with the iconic BLACK SABBATH frontman for this past summer's tour that marked the thirtieth anniversary of when the two first collaborated together. Wylde originally joined Osbourne's band three decades ago and backed the legendary frontman from 1987 to 1995, then again in 1998, from 2001 to 2004 and also from 2006 to 2009. His guitar playing can be heard on Osbourne's studio albums "No Rest For The Wicked", "No More Tears", "Ozzmosis", "Down To Earth", "Under Cover" and "Black Rain". The first album with Wylde went double platinum and "No More Tears" remains Ozzy's most successful album, going four times platinum in the United States with four Top 10 songs on the U.S. Billboard chart. Wylde also appeared with Ozzy on three live albums.